We had a face to face meeting with Rob a few days before our wedding which put us at ease. Rob definitely knows what he is talking about when it comes to music. I had put together a very extensive play list which could have put any DJ off but Rob was so accommodating and really understood the mood we were trying to create for our wedding. Rob not only played the music we wanted but arranged all the songs in an order for the night that was spot on. All our friends say it was the best wedding ever and that has a lot to do with the vibe Rob created with the music. We had everyone from older grandparents to 5 year old kids on the dance floor! Rob was not only great with the music but also a pleasure to deal with, nothing was too much trouble and requests from our guests were made with a smile! I would definitely recommend Rob to anyone that is considering a wedding in Bali. He gets it! I would like to thank Rob for the amazing job that he did at our wedding and all the extra bits he did beforehand. Firstly, Rob was able to perform at our wedding with very short notice – only 3 weeks due to things not working out with our original dj. From the get go, he was easy to communicate with and answered all my questions and was extremely easy going and put my mind at ease. 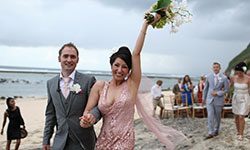 Once we arrived in Bali, Rob contacted me to say he had an appointment with my wedding planner and invited us to join them. We then all met up at the venue and all the finer details were organised. We casually mentioned to Rob that we had chosen the song I wanted to walk down the isle to however we had not managed to download it. Rob volunteered to get it for us and shortly thereafter it was sent to me. Rob organised the sound system, lighting and microphones that were used at both the ceremony and reception. The music that Rob played was EXACTLY what I wanted. During dinner, the music was amazing, I became a little concerned that he was playing all the good music too early, but the good tunes just kept on coming. A few requests were made and without skipping a beat, the songs were played. We danced the night away. I highly recommend Rob if you are planning any event in Bali. BRILLIANT, EXCELLENT, FANTASTIC – a few words I would use to explain my experience with Rob. Thanks for making our night such a memorable one. Thank you, the music was 100% exactly what we wanted. All my guest thoroughly enjoyed it. Your service and communication was excellent the consistent communication via email before the wedding was very good especially the courtesy calls before hand to find out what kind of music we wanted. The timing was excellent, I wanted to a nice feel at beginning of the night and advised you to pick up the tempo as the night went on. This was done perfectly. You sticked to all agreements made, especially denying request for the first few hours unless we told you it was okay! You looked and acted very professional and presentable I am surprised my guest did not try and make you drink! You were very flexible with request after I said play what ever, I was really surprised at how fast you could mix things in. My guests loved it. Overall Rob, Aileen & I had a blast and would definitely recommend you. Thank you for being part of our special day! Thank you again. Thanks for you excellent performance during our wedding! You had a really good selection of music to have with the dinner and when we were done you had awesome dancing music. All in all you did an excellent job, me and Lani were very impressed. Got tons of good feedback from guests as well and we wouldnt think twice about hiring you again! Just wanted to add this on, that it was really great that you worked and got all our guest song requests too. The music helped keep up the energy of the party the entire night. My only comment, and this is to other wedding couples, not to you! Is that in retrospect I wish that we had settled on some of our song choices much earlier, so we weren’t doing it in Bali the day before the wedding. From first contact until after our Bali wedding, Rob demonstrated very high levels of profesionalism in both the technical side of the wedding party and prompt communication via email and SMS messages. He answered any queries instantly, and honestly. This included a meeting before we agreed that Rob would play our wedding, simply to meet up and chat. Not only did Rob stick to the agreement, he went above and beyond by playing extended set, and gave up his whole weekend to entertain our guests and make it the perfect weekend celebration. Rob got the music selection perfect, and played to the crowd perfectly. His choice of background and pre-dancing music was perfect, and when the time to dance came he entertained the guests perfectly with a mix of older and modern music which kept the whole crowd happy. All the guests complimented us on how good the choice of music was, and how Rob played all the requests that were thrown at him. Not only did Rob play on our wedding day, he also played at a beach party the following day. This was again a great choice of music, and kept the guests going whilst on the beach and mixing amongst each other, he got the vibe for sure. All in all, Rob did not only meet our very high expectations, but soared way above, and his entertainment was a key element in making our wedding weekend memorable and superb. I could not recommend him highly enough, for value and entertainment. Rob’s service and communication before the wedding day was excellent. Rob asked for questions for the kind of music we liked and quickly understood our preferences very quickly. We also had a ore wedding met in Bali which calmed our nerves and gave us complete confidence that rob was the right choice of dj. Rob was punctual and arrived exactly when he said he would. He is very reliable, and stuck to all the agreements that we made. We are absolutely satisfied with the chosen musical repertoire, Rob sensed the vibe of the wedding party and played the music to get the guests up and dancing. He looked very proper/ representative, acted in a professional manner througout, and showed flexibility by accepting song requests from the attendants. Wihout a doubt, we recommend him to other wedding couples. We couldn’t have been happier with rob. He is a excellent dj who takes pride and is passionate about his work and is an all round good guy. He is the man for any wedding or any party.